AD: So, why this as the album title? Did you realize Sufjan Stevens was never going to make it through all 50 states and you decided to jump in and help him? AD: Yeah, it’s a state that when you think about it, and no offense to anyone who lives in Ohio, but when you think about it, me personally, I don’t know what comes to mind. KW: Not much. And I kind of like that, as a word and stuff like that. It’s a little more undefined. I think that’s kind of – there’s something neat about that. It makes it possible to make a connection between that and this music and artwork, etc. AD: How big was Lambchop this time around? KW: Well, it’s pretty similar to the band from Damaged. 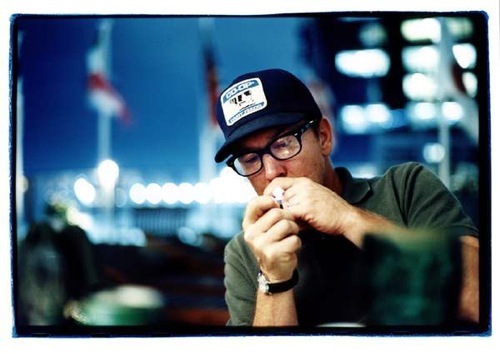 Basically Lambchop has been distilled down into a group of 7 or 8 people who can travel and perform live. And I wanted to see if we could make a record that could represent the sound that that small ensemble made, so we didn’t dig into the alumni association file too much to make it. It’s more representing the sound of these guys who have been the core of the group. AD: Are you going on the road for this record? KW: As a band, yeah, eventually in the United States, we’ll be doing a lot of European stuff. I’m doing some solo performances to sort of pick up the slack of not having a band prior to the release. We’ll do a lot in Europe in the fall and the United States, hopefully, in January. AD: Speaking of solo shows, you released a self-title solo record last year..
KW: Well, I didn’t really release it, I just sort of sold it at some solo shows here and in Europe. It was just sort of leading up to the recording of the record and I thought it’d be a new approach for me as a writer to try to perform these songs solo and see how that went. And that was the way of developing the songs before I brought them to the band, and we went ahead and made a recording to put out. AD: The two records – Kurt and OH – share about five songs? KW: Yeah, maybe even one more. That was a starting point and then I went on the tour and then I worked on almost all the songs except for a couple. And that was my chance to sort of start to develop them – just so it was a different approach to the way I go about writing. They changed as the performances went on. It was just an idea to go out there and play songs and work on them in the live context. I was kind of interested in seeing what would happen if I did that. I’ve never tried that before. AD: So how did it work out? KW: You’d have to tell me. [laughs] As a process, I was really happy with it and as results I was really happy with it. There was something a little different about how these songs have come together and how they sound, I think. It was a good process. AD: How would you normally have done this? Would you just take the songs directly to the band? KW: Well, yeah, in general that was the sort of standard procedure. I would write things and take them to a certain point, but they’d never been performed or solidified in that way. The band would then undertake that part of it and it would become more of a finished song through that working with the band. So I was trying to find another way to sort of jump start the songwriting thing. AD: By you having documented the solo stuff, it creates two different versions of a song that, while the same, aren’t. I think a good example of that is “Dissolved, Slipped and Loosed” and when I saw it pop up on the new record, I was excited. AD: There’s a song that’s shared between the two records that the title actually changed also – “Stand” to “Please Rise.” So is the new album more polite as well? KW: [laughs] Perhaps. It’s well-mannered. [laughs] I barely cuss on it at all, that’s good. AD: Yeah, it makes it easier for radio. AD: As best as you can do a double take when you’re listening to a record – the last song on the album is a cover of “I Believe in You” – I guess the most famous version is Don Williams. And I guess it’s kind of this – I don’t know – I don’t want to call it a hoary old standard, it’s not that old.. AD: Well, it’s got this kind of sappy quality – what drew you to take that song on? KW: Well, I think when it came out, I originally felt that way – that it was uncool and kinda syrupy. But I think I have a different perspective on it now, but in a lot of ways it’s sort of topically relevant today, but more than that, I’ve stared looking at it as something that came out of Nashville. The songwriters who wrote this came from Nashville and here’s this smoothy, talk-singing kind of guy who did it and I’ve started to really appreciate what that was that he was doing and the fact that it was from Nashville. So there’s some kind of relationship there and then overall, the song is kind of uncool still, but I kind of like that. In a way I thought it was kind of good for us to present something that was devoid of irony. If we were a different type of group, the irony might be more apparent – if we were a punk rock group that played it or something. But I think we tried to present it in a pretty straightforward matter and let it lay there as it is. And I think it worked out okay. I’m just sort of interested that we can sort of represent that kind of idea now. I don’t know why it works now, but wouldn’t have earlier. I think if we’d done it ten years ago, it would’ve seemed more ironic. I’m interested in that. Why is that? I don’t know. AD: Is that the benefit of becoming..uhm.. AD: Well, I was going to say ‘an elder statesman’ of whatever the alt-country movement is at this point, or just an elder statesman of music in general? KW: Well, I think that’s true. I never have been too comfortable with the whole alt-country identity we’ve been given, but at the same time, here we are doing a country song, which I think is pretty rare for us. Maybe we’re sort of able to look at that now and say, hey, that’s okay. As I learned a little more about the songwriters, I learned it was a little more subversive when it was first written. There’s a line at the end of the song – ‘the rising cost of getting by’ – and originally the songwriters had written ‘the rising cost of getting high,’ but of course, that wasn’t going to fly on country radio. So they changed it. But that intrigued me, that the songwriters themselves were a little different than your normal songwriters in Nashville. And there was a strange tie also – one of the writers was named Roger Cook and he had a daughter that was hanging out in the scene when we were doing things in the 90s, so there’s that connection there as well. AD: Your lyricism – people have described it as being surrealist or, the phrase that came to my mind, was hyper-literate – it’s very verbose for pop music. For you, for the songwriting process, do the lyrics come first, or do they come with the music – how does your writing process happen? See, it’s really goofy, but it ends up making sense. And I just let things like that see where they go. And I think by setting up some sort of framework or criteria or method or whatever you want to call it, it guides you to a place you wouldn’t have gone and it makes for interesting listening. Sometimes I think if you separate the lyrics from the music, it becomes more confusing in a way because you don’t have that music as a sort of adhesive to make it all sort of work together. AD: So, if that’s the way you think, are you the type of person that would never consider having a book of your lyrics published like Leonard Cohen or Dylan or someone? KW: Well, I’m up for that, but that’s something I’ve been avoiding addressing, particularly while still making music. I only actually put lyrics in booklets initially because we were releasing so much stuff in Europe and they were struggling so much with the language. They were always requesting, ‘why don’t you do that? It would make it a little easier to follow,’ so I sort of relented and we did that for a long time. With OH, I’ve sort of gone back to the way I used to be. I didn’t want to present them as prose. So we decided not to have a booklet, so you’re really back to just listening to the music and words together and figuring it out on your own. But I think that kind of reflects how most people receive music these days anyway. Whether it’s because you downloaded something or you’re streaming something, you don’t have that – a lot of people don’t care about that anymore. They just want to listen to that one particular song. I think that’s telling about how we receive music these days. Music’s become this accompaniment to other activities or other things – whether it’s a film or a tv commercial or going to the grocery store or standing in line at the airport or whatever. AD: You’ve worked with different people over the years, but there is one project that sticks out in my mind. Back in ’99 you did an EP with Josh Rouse called Chester. I know this is 9 years after the fact, but could you talk a little bit about how that happened? You wrote all the lyrics for that record and Josh wrote all the music, correct? AD: Or maybe like calling a record Jerry Garcia and Robert Hunter? You never saw a record like that, so it’s interesting that you’re the co-headliner on the album even though you’re only on it lyrically and those few musical parts. AD: The title track. If only everyone else had stepped up they would’ve had a shot at that. KW: [laughs] Well, they just ran out of time. It was pretty funny really. So I said, what else haven’t we tried? So, yeah, I said, this other thing. So that’s why we did what we did. I kind of forgot about that. AD: Have you ever had anyone floating around in your head that you would do something like that with? Just getting around to reading this. Great stuff. Really enjoying OH (Ohio). Howdy. Very first I wish to say that I really like your web site, just found it last week but I’ve been reading it ever since then. Thank you for any great website and I hope you keep up the great do the job. If you do I will carry on to checked out it.